The OUS group, Genome Dynamics (GD) and Public Health (NIPH) organized a very successful Tuberculosis meeting with colleagues from Ethiopia, Sudan and South Sudan January 29 to 31, 2015. 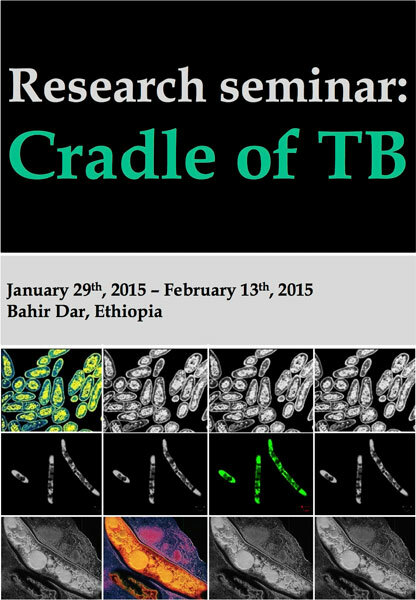 The meeting “The cradle of TB” gathered 65 participants in the city Bahir-Dar in northwestern Ethiopia. “Achieving such a successful meeting between Ethiopia, Sudan and South Sudan - right under the African Union Summit - is unique, all honor to Solomon Yimer”, says professor Tone Tønjum, head of the Genome Dynamics group at Oslo University Hospital. Scientists, university professors and lecturers, Ministry of Health and Regional Health Bureau officials, Tuberculosis Control Program managers and experts and other non-governmental organizations from Ethiopia, Norway, Sudan, South-Sudan and France will be participating in the seminar. One third of the world population is infected with tuberculosis and five to ten percent of those infected develop the disease. In 2013, Sub-Saharan Africa had the highest cases and deaths of TB per capita and contributed a significant proportion to the global TB burden (WHO 2014). The incidence in Ethiopia is estimated at 224 cases per 100 000. Many people with tuberculosis remain undiagnosed. A new phylogenetic Mycobacterium tuberculosis lineage (lineage 7) has been identified in the Amhara Region of Ethiopia. This lineage is exclusivly found in this region and shows a delay in disease onset spesific for this linage (Yimer 2015, in press). The conference will provide conference participants with recent knowledge on TB epidemiology, genomics, diagnostics, TB health information system and on how to conduct operational research. An equally important aim is to facilitate networking and efficient knowledge exchange within ongoing collaborative research projects or for the generation of ideas for new projects between the collaborating partners. From left: Solomon Yimer, representative from GD at OUS and UiO in the seminar committee, Zebideru Zewdie, the Director of Public Health Services in the Amhara region, ARSHB, Bahir Dar, Ethiopia and prof. Tone Tønjum, representative og adviser for the seminar committee at GD (group leader) at OUS and UiO.